Before I say anything else here, I need to point out that you have to click on the scans below if you want to take a closer look at them. Maybe you've been doing that all along, and this is old news, but I thought I'd mention it now, just in case. Because I can only imagine how big of a bummer it must be for some of you to come to these posts only to then feel disappointed by how small the manual scans initially appear. 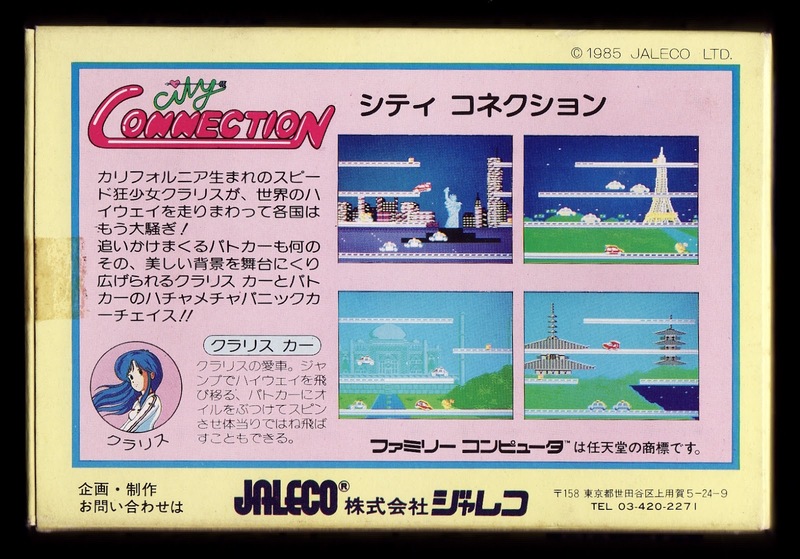 With that out of the way, let's get to the focus of this write-up: the instruction manual produced for the Famicom port of Namco's (or in this case, Namcot's) The Tower of Druaga. If this is the first you've heard of this 1985 release, it's basically an action RPG set in a maze-filled tower. Or I guess you could call it an old-school tower-crawler (as opposed to a dungeon-crawler) with some randomly generated elements. Sadly, both of those descriptions make The Tower of Druaga sound a lot more interesting than it really is. In reality, the game's awfully repetitive -- both from an aesthetics and gameplay standpoint. Every one of the 60 floors of the titular tower look pretty much the same. The enemies that stalk those stages change now and then, which is nice, but I'm not sure I'd say that'll be enough to keep your eyes from glazing over at some point. Also, the same jangly tune plays throughout this often-laborious adventure. Which would be fine if the tune in question were as much of a bop as, say, Bubble Bobble's theme, but it's not. Its cart label is similarly snazzy, by the way, and as you've learned via this blog post, its instruction manual has plenty going for it as well. My favorite part of The Tower of Druaga's manual, it has to be said, is its last couple of pages. So much entertainment can be gleaned from its handful of hastily crafted (or so it seems) illustrations. The best of the bunch, of course, is the dragon that can be seen in the top-middle square on page seven (two scans above), although most of the others are worth ogling, too. What do you think of this particular piece of gaming paraphernalia? Do any portions of it speak to you, or at least mildly interest or amuse you? If so, share your thoughts in the comments section below. The 1980s were great for folks who enjoyed playing video games with completely off-the-wall settings and premises. There was a game that starred two brothers who, upon being turned into bubble-blowing dragons, set off to rescue their kidnapped girlfriends from a skeletal whale. Another noteworthy offering was a text adventure featuring nothing but anthropomorphic fruits and vegetables--with the protagonist being a cucumber knight. Hell, the cartridge that helped make video games a household name around the world--its main character being a mustachioed plumber who spends his free time eating spotted mushrooms and tossing fireballs at meandering chestnut-shaped baddies with Brooke Shields-esque eyebrows--made its debut during this decade. 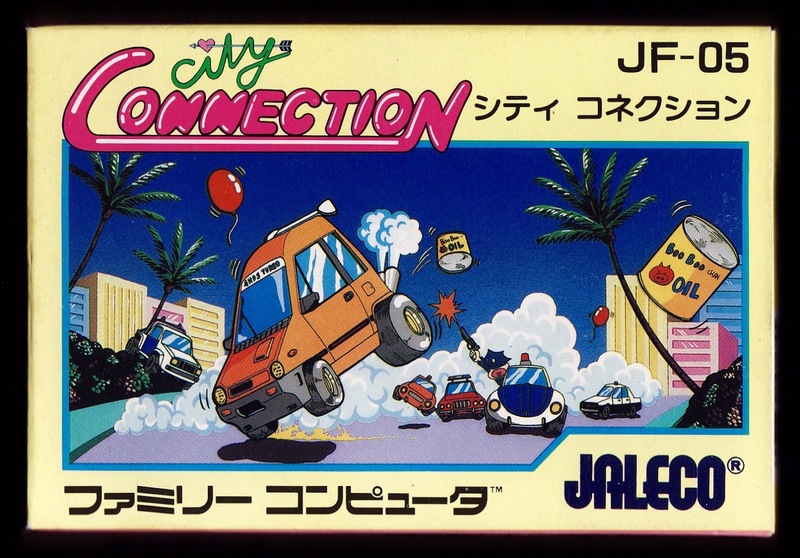 In that context, a pithy platformer that puts players into the driver's seat of an unstoppable hot rod and tasks them with painting the streets of various tourist destinations (London, New York City and Paris among them) seems positively pedestrian. 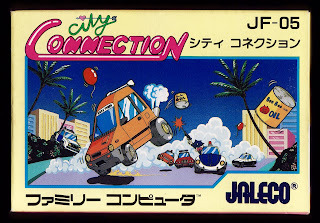 That's not to say Jaleco's City Connection, which began life as a quarter-muncher before being ported to the MSX and Famicom, is a bore. In fact, I'd say it's the polar opposite of that. OK, so there's a bit more to City Connection than that. While you're busy aiming your car and timing its jumps, you also have to keep an eye on the road before you. This is because sharing the pavement with you are police cars, spikes and cats. Run into any of them and you lose one of the small handful of lives given to you at the game's onset. If all of that sounds kind of ridiculous, well, it is. It's also surprisingly enjoyable--and even rather addictive. 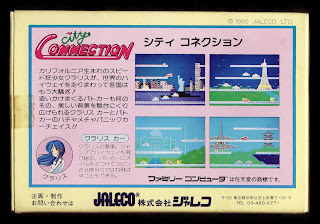 Basically, City Connection is one of those old games that's easy to stick into your Famicom, play for a few minutes, bop your head to the brilliant backing tunes and then return to the rest of your day. Which I guess may sound disappointing to folks searching for another title to add to their "games are art" discussions. Plenty of titles, old and new, fit that description, though, so my suggestion is to forget about that for the time being and accept City Connection for the simplistic fun it ably provides. Who else is thrilled that Nippon Ichi's Yomawari will be released in North America later this year? I'm talking about the timing of the post I published yesterday, of course. 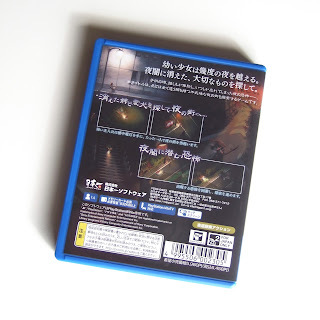 The one about Yomawari's lovely case, cartridge and instruction sheet. If you're wondering why I'm so pleased with the timing of that write-up, that would be because last night NIS America announced it'll release the previously Japan-only Vita game named above in my neck of the woods (North America) late this year. That's some pretty thrilling news, if you ask me. After all, this spooky title features some absolutely stunning environments--not to mention some beyond-creepy enemies. As awesome as Yomawari: Night Alone (that's the full North American title) looks, I'm not sure I'll buy it once it's finally available here. That's only because I already own a copy of the Japanese version, though. What would push me toward buying it? A cheap price tag probably would be enough to do the trick. Should it be sold for more than $30 or even $40, I'll likely pass. In the meantime, I'm going to make it a priority to spend at least a couple of hours with my Japanese cartridge in the next week or two. Assuming that actually happens, I'll whip up post about it so those of you who are on the fence regarding Night Alone can turn to my impressions when you go to make a decision. 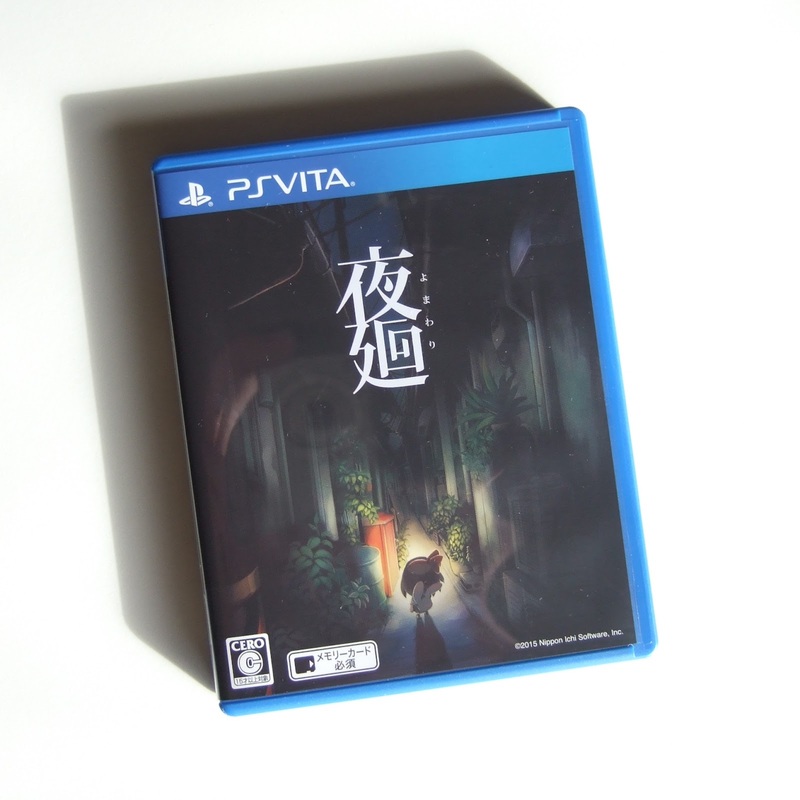 Speaking of which, do any of you think you'll buy Yomawari: Night Alone, even if it's only given a digital release in this region? Or does the trailer above make you think it's not going to be your cup of tea? 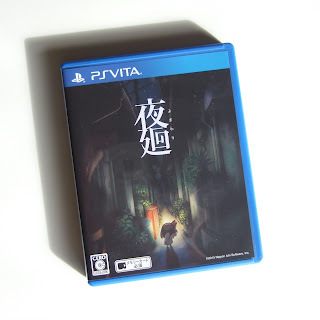 Just before Halloween last year, Nippon Ichi Software released Yomawari, a Vita title that ticked off so many of my personal "these things make a great game" boxes that I decided early on it would be a travesty if I didn't pre-order a copy as soon as possible. After all, Yomawari is both adorable and sort of creepy. Also, it has a great logo and sports some unquestionably stellar cover art. And then there's the fact that it was made by the wonderful artists and programmers at Nippon Ichi, who have more than earned their reputation for being able to produce endearingly odd video games. Pretty much all of the components I just mentioned are showcased in the photo above, by the way. I guess you could say they're on display in this post's second snapshot, too. Sure, the yummiest traits of this Vita game's cover art are kind of compressed on its cartridge label, but I think it's still pretty snazzy even in its slightly altered state. 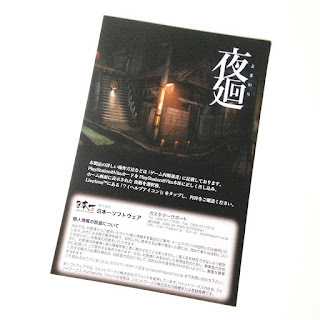 Sadly, Yomawari's otherwise beautiful packaging doesn't include an instruction manual. It does include the following slip of paper, the flip side of which is filled with text that appears to be of the "don't step on this cartridge with your smelly feet" and "try not to dunk this cartridge into a mug of steaming hot coffee" sort. Oh, well. At least it features another gorgeous--and moody--illustration, right? 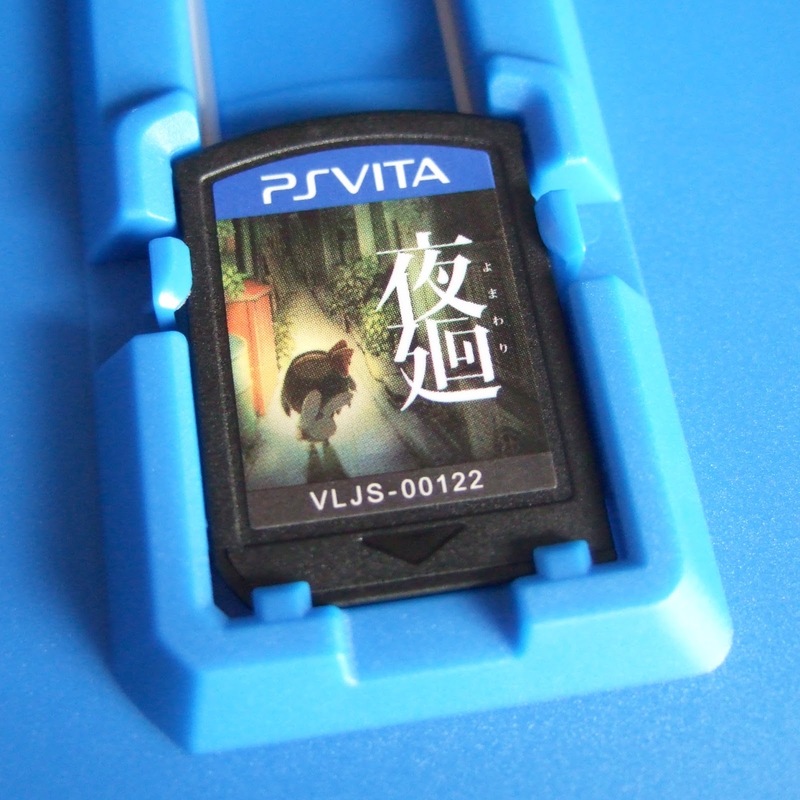 Would you believe I've yet to even stick Yomawari's cart into my much-loved-but-often-ignored Vita? Yeah, you probably would--especially if you've been coming to this blog for any period of time. I promise to do my best to rectify that situation in the next couple of weeks, though--despite the fact that I'm not really in the mood for a scary game at the moment. I'll also do my best to play some of the other Vita titles that have found their way into my arms in the last few months--some of which I'll chat about in my very next write-up.